Revolution is now operating a Rapid Shot Machine located on the 2nd level of rink #2. RapidShot is a patented hockey training system that automatically passes and collects hundreds of pucks an hour. There are 8 pass speeds and intervals for training slap shot, wrist shot, backhand and one-timers. 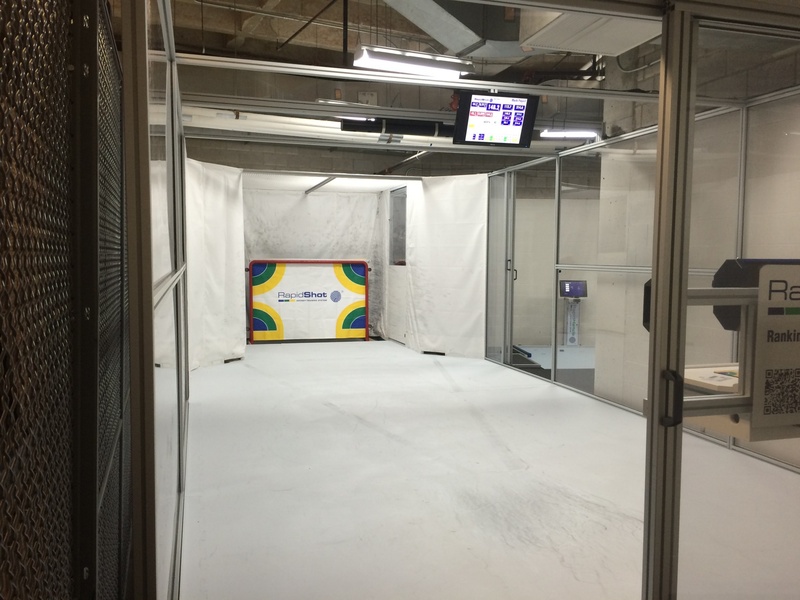 RapidShot is the most advanced computerized shooting system in the world that measures accuracy, shot speed and reaction time. Rapidshot measures the players’ speed in accepting the pass, their velocity in shooting the puck and their accuracy in hitting targets. On the ice, in the heat of a game, you must find the spot on the net that the goalie “gives you”. The faster you perform this task, the harder it is for the goalie to make the save. The RapidShot Hockey Training System simulates the least covered corners of the net, randomly lighting up one of four lamps just as you receive the pass. This forces you to have the goal in your field of vision while receiving the pass. The time from receiving the puck until it leaves the blade is measured with high precision. The reaction time is displayed on the monitor for each shot, as well as your average for the current series. All other factors being equal, the faster the puck speed the harder it is to save. The puck speed depends on multiple variables; having the right stick, your physical strength. But the most important is a highly developed and consistent technique. 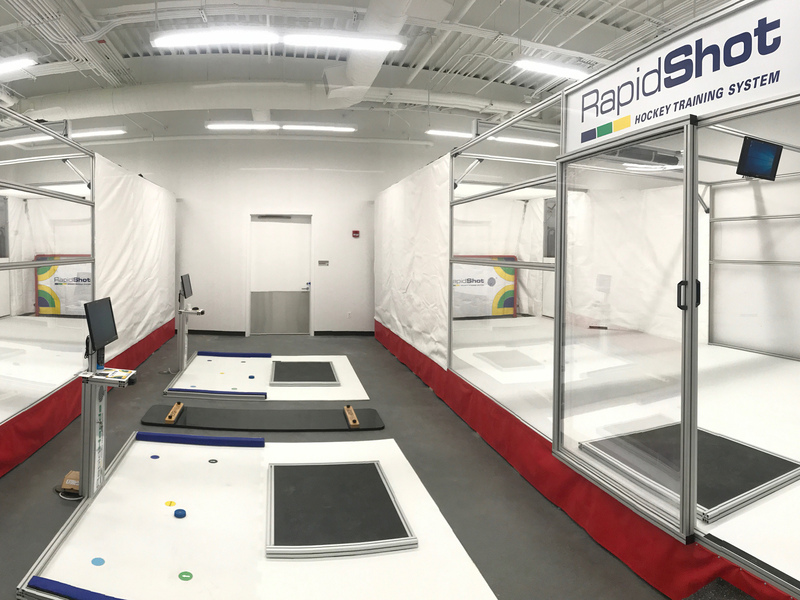 By having immediate feedback and the maximum rate of repetition within the shortest period of time, the RapidShot Hockey Training System allows you to learn the best technique! You can learn to optimize your puck speed, without sacrificing reaction time or accuracy. Your puck speed is displayed on the monitor immediately after a target is hit, along with the average puck speed of the current series. 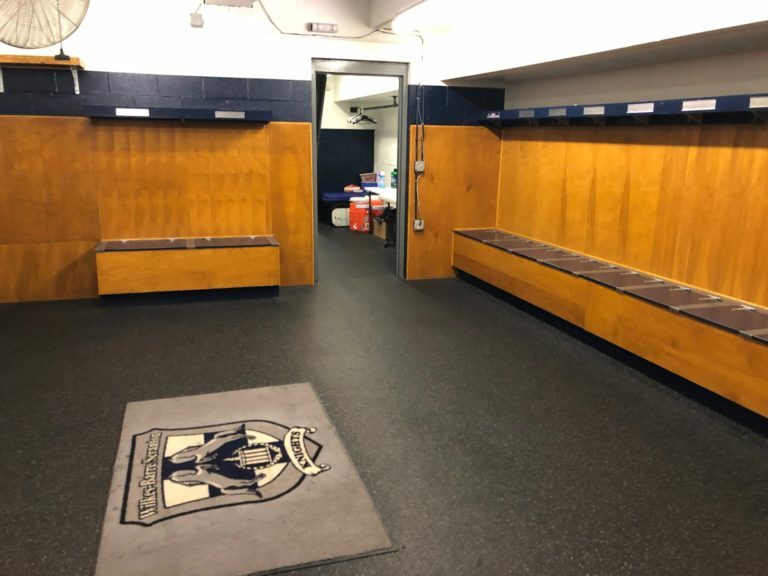 Only RapidShot makes it possible for the player and coach to evaluate accuracy, by observing the shooting statistics recorded in each corner. RapidShot stats can identify strengths and weaknesses, by corner. In addition, each of the four corners of the goal is subdivided into 3 target sections, blue, green and yellow. The blue targets are the hardest to cover by the goalie. They result in the highest score when they are hit, but represent the highest risk of hitting the post or missing the goal. The user is shown his precise level of accuracy immediately and in long-term evaluations right at the lane monitor, and also at the member site on the internet. The RapidShot is equipped with a card reader. As soon as a card is swiped through the reader, the RapidShot computer is activated for that user and awaits your commands. The RapidShot Hockey Training System is controlled by command buttons. Players use the command buttons to adjust the 8 passing speeds and 8 intervals between passes. Players can choose between Competition Mode, Dual Mode, Training Mode or Stick Testing Mode. Select start and keep your head up… a series of 16 passes will be fired at the speed and interval selected. An instant before each pass reaches the player’s stick, the shooting target will light up. The speed, accuracy, reaction time and an overall point value are instantly calculated after each shot and displayed on the computer monitor. After a session of shooting, members can view their Day Report on the internet site, summarizing their performance. Details include speed, reaction time, points, hit rates for each target and World Rankings status. All rankings recorded during Competition and Duel Mode shooting are uploaded to www.rapidshot.com regularly throughout the day. Players can visit the web site at anytime to monitor their standings and compare with other players in their age group. * NOTE, because you are not a MEMBER, these cards will not be registered with RapidShot online to track your score against the world.